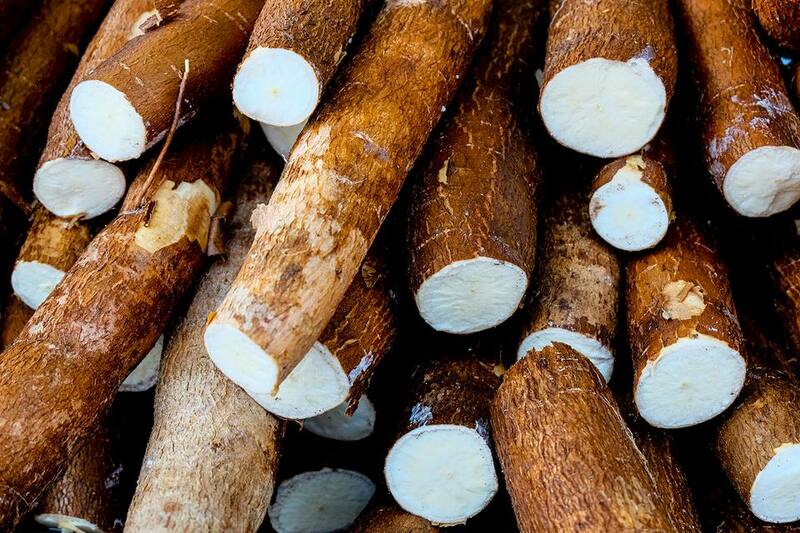 Cassava root isn't as common a culinary ingredient in the United States as it is in some other countries, but you might know it better in its dried extract form as tapioca. Cassava roots have a nutty, earthy flavor that's well-suited in cuisines that hail from where the tuber originates, including various Caribbean islands, South America, Africa, and parts of Asia. The root is gluten-, grain-, and nut-free, making it a potential food substitute for people with allergies. Because Americans aren't used to seeing the whole root, which is also known as yuca, it is helpful to know how to select, cut, and prepare the root for cooking. When you find yuca roots, select those that are firm and free from blemishes or soft spots. The roots should have a clean fresh scent and snowy white center when cut open. The best way to check if the root is still good is to break off the end of the yuca. If the flesh has black specks, lines, or any discoloration, it should be discarded. Rotten or decaying roots have brown soft spots and a putrid smell. A vegetable peeler is not recommended for peeling yuca because the skin is very thick and usually covered with a protective wax coating. You'll end up hurting your hands and getting pretty frustrated with the whole process. Instead, use a sharp knife. Cut off the ends of the tuber, slice it into 2- to 3-inch segments, and then stand the root up on its end. Slice vertically down the edges of the root until the skin has been completely peeled off. Stand the root pieces on end. Cut the peeled root in half lengthwise to expose the woody core. Next, cut the yuca halves lengthwise in half again, so that the root is now quartered into long sticks with the core exposed. Cut off the inner corner of each yuca wedge to remove the woody core and discard it. The cassava is now ready to cook in a recipe or store for future use. Although you can cook the yuca first, then remove the core, it is recommended to remove the core before cooking. Truthfully, you don't have to remove the core at all, but then you will have to eat around it since it's not tasty. Peeled cassava can be stored in the refrigerator covered with water for up to 4 days, or you can freeze it for several months. The starchy tuber can be used in the same way that you might prepare potatoes—steamed, baked, mashed, boiled, or roasted. You can also turn them into yuca chips which are similar in preparation and taste to potato chips, as well as yuca fries, which are just as crispy and delicious as french fries. The most common Caribbean cassava recipe is for casabe, a cassava flatbread. Yuca is also an essential ingredient in yuca con mojo, a Cuban dish of cassava in garlic sauce.